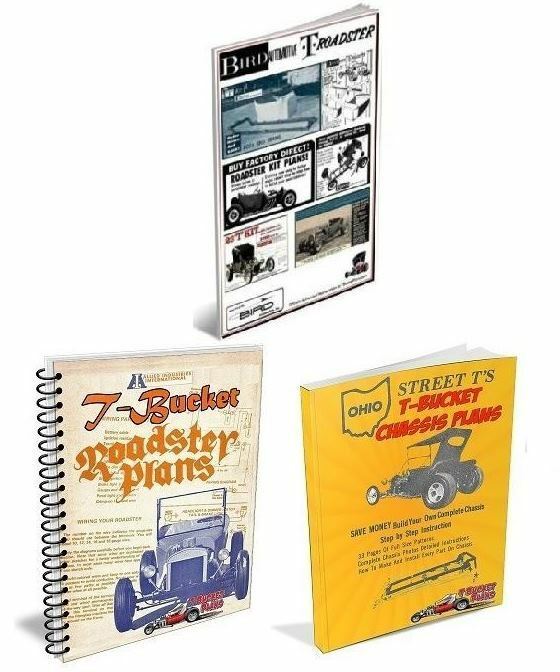 Here are 3 sets of nostalgic T-Bucket plans from the 60s and 70s that are full of tips, tricks, information and inspiration for any T-Bucket fan. And with this budget bundle you get all three for the price of two! To start, there’s not a baby-boomer hot rod fan that didn’t get excited seeing the widely advertised Bird T-Bucket kits and Bird T-Bucket Plans that showed how to build one yourself once you had a T-Bucket body. Not long after the Bird T-Buckets hit the market another Midwestern T-Bucket kit car company appeared on the scene and while the Allied Industries’ nostalgic T-Bucket plans were not as popular they included some neat T-Bucket building techniques not covered in the Bird plans. Moving on to the the decade of the 1970s yet another Midwestern source of nostalgic T-Bucket plans appeared in the form of Ohio Street T’s. And their plans are an undiscovered treasure! While rough around the edges, these plans are incredibly detailed and explain numerous ways of building a T-Bucket that you’ll find very helpful today. This nostalgic T-Bucket Plans budget bundle will take you back in time with tips and tricks you’ll want to use today in building a T-Bucket. Just click on the “Add to Cart” button and get ready to download a cool batch of nostalgic T-Bucket plans that’ll inspire you and bring back memories.